.... to each and everyone of you. I know I haven't been hopping much but I'd like to thank those who still drop by here even if I don't get to return the favor as often as I should. We had one busy week last week. I am hoping this week will be less stressful and won't be as busy as the last...at least not with the same reasons anyway. I would love to be busy with work but it's not happening. Although, I'm keeping my fingers, toes & eyes crossed that work will come pouring in this week. No harm in wishing, right? It's alright, J! Just take your time and take that needed rest. hahaha! Good Job ate J.. great advice! Cute and at the same time gross hehehe. 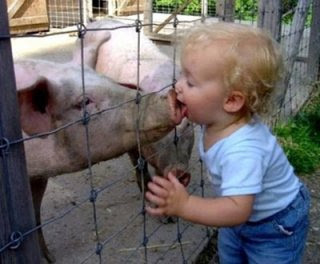 Cute naman nang kiddo but very true, that's the best way to get Swine Flu hehehe. Yeah here in Canada it's the talk talaga especially na may reported cases na dito sa province namin, very scary. Anyway, have a great week din Ate J! photoshopped ba yan? I don't think any mom would allow their toddler to actually do that. dungis nung pig. our week will be gloomy and wet. sa Firday pa yata mag clear. it's heating up na dyan no? hanggang 50's lang kami today.